Well, you knew we were hardly going to stay off the water forever! It should come as no surprise to hear that we returned to our beloved LUSH for a spot of racing in the Caribbean last week, massive thanks to Eddie & Marie Jordan. 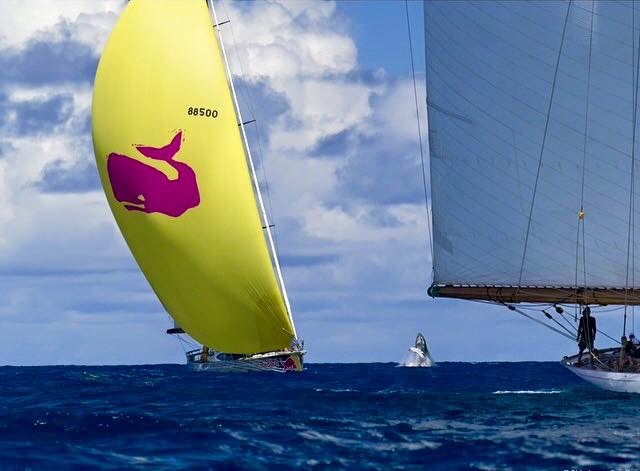 After a super time last year at the St Barth’s Bucket, superyacht regatta, we re-entered the event this year. Every spring the worlds most magnificent and exquisite super-yachts congregate in this stunning French Island for their annual Caribbean showdown. Arriving onto LUSH felt as though we had never left. The four new crew members are doing a super-duper job and have had a busy charter season in the Caribbean. It was such a treat to be onboard as Eddie & Marie’s guests even if it did feel a bit odd sleeping in one of the beautiful guest cabins while the crew were up forward in the more compact crew quarters! Mind ya, we didn’t have much of a chance to swan about as “guests”, we were actually onboard as race-crew and so got straight into race mode on arrival. You’ll see from these photos that it was the wildlife and not the racing or the magnificent Superyachts that stole the show for us this week. 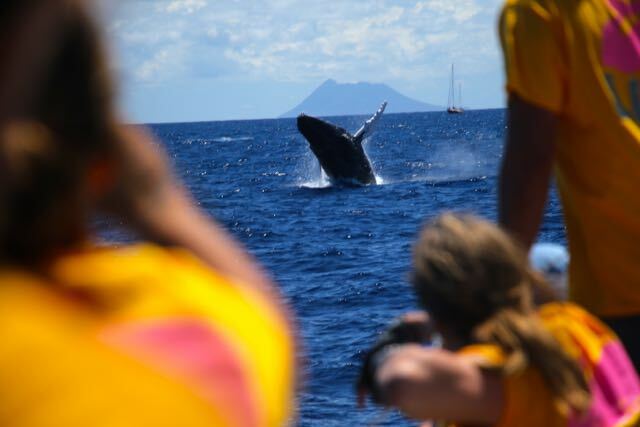 We thought we had seen it all on our circumnavigation and then low and behold, right in front of LUSH, out of nowhere, a massive Humpback whale breached within a boat-length of us on the final race of the event. And it breached again on our beam as we sailed past and by our stern and a few more times after that. Wow, wow, wow!!!! Just imagine this mammal, weighing in around 40 tones with a length of 15 meters, launching itself out of the water with unbelievable power and verocity and then landing with an enormous splash. Eddie, Marie and the whole crew were left speechless (which is unusual for EJ), we were in total awe, and needless to say we lost a bit of focus on the racing! Humpback Whales breach for a variety of reasons but in this case we’re pretty sure it wanted to check out the beautiful pink whale printed on our spinnaker, I guess it’s been the talk of the ocean since we set sail over two years ago! Plenty of other yachts in the vicinity witnessed these awesome breaches too and managed to snap these photos and send them onto us. It’s so rare to get these breaches this close to a yacht let alone on camera and massive thanks goes to the photographers. I do hope they get plenty of recognition for such wonderful pics. Now back to the racing…. 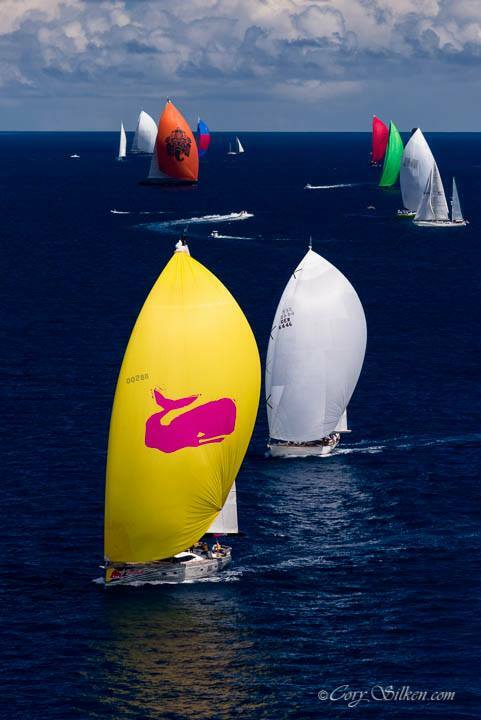 Racing against superyachts is very different from your regular yacht racing. For starters there’s millions upon millions upon millions of pounds worth of yachts sailing against each other and LUSH was actually one of the smallest yachts in it, if not the smallest! Yachts should actually be 31 meters and above to enter the Bucket and at 26 meters an exception was made for us under the ‘Grandfather Clause’ which basically leaves it up to the discretion of the Bucket organizers to invite us to race. The biggest yacht entered was 56 meters, which is 183 foot!!! And remember every foot gives you so much more in volume so these yachts were just massive!! There were 21 of us onboard for the racing with at least 10-12 of those helping with the launching and dousing of our massive 5,500 sq foot yellow spinnaker. Full on!!! Paul was on the helm and I had the “safety officer” role again. Every yacht completing must have a safety officer and there are various qualifications and credentials one must have to carry out this role. I actually had to give my racing CV to the race office as part of the “requirements to race”. The safety officer must be a member of the afterguard whose sole responsibility is in communicating with the other yachts on the VHF while racing and communicate the racing rules, collision avoidance and safe maneuvering of the yacht. When racing against yachts of this size you can’t just throw in a quick tack and expect the other yacht to respond immediately. Our Oyster 885’ was one of the more maneuverable yachts there but on a 55 meter Perini Navi it’s a whole other ballgame when it comes to tacking and gybing. These giants of the yachting industry made LUSH look like a topper dingy when beside us and we would be cast into darkness as they blocked the sun sailing next to us and as for the wind…. well you just don’t want to be the leeward boat! It was great catching up with oul pals from the yachting industry and it was particularly lovely to meet my cousin Caragh, who raced on a gigantic Wally yacht for the week. Caragh is a true inspiration to any of you out there who dare to give up a life in the office for the ocean waves. She took up sailing a few years ago when the Volvo Ocean Race came to her home-town in Galway and last year she packed in her day-job after racing Round Ireland on a chartered Volvo 70’. Man has she got the bug! She was then offered a job onboard the 70’ sailing the Med and then onto the Caribbean for race charters where she has spent the last few months sailing and racing the warm crystal clear waters there. And then she lands herself on one of the biggest yachts racing in the Bucket for the week! One Life… she’s living it, that’s for sure! So if this is the kind of life you want, then stop kidding yourself by doing something else! The only thing in your way is you yourself!!! Go for it and who knows where you might be this time next year! Back in the UK now and Paul is all go with his online skippers leadership programme, which he recently launched after months of work and research. This is a programme that Paul personally developed called the 7 Master Skills of Highly Successful Skippers and is an industry first in skipper leadership training. If you’re keen to get your hands on these awesome free training videos click here to see what Paul has to say about them and sign up today! One Life… Live it and just go for it!!! Massive yacht under Lush’s Boom! Lush on her way to finish! Great stuff! Thanks for sharing this. It really was amazing Daria! Hope all well in the west!